Witness Norway’s breathtaking fjords and discover Iceland and coastal Northern Europe on this unforgettable sailing. Before departing, make time to explore the rich history and vibrant culture of London. While in Reykjavik, experience the healing properties of bathing in the warm, mineral-rich Blue Lagoon. In Flam, climb via train from sea level to 2,800 feet, crossing rivers and travelling through 20 tunnels. And visit one of Amsterdam’s superb museums featuring many of the Dutch Masters’ most outstanding works, or learn about Anne Frank and the city’s Jewish heritage. 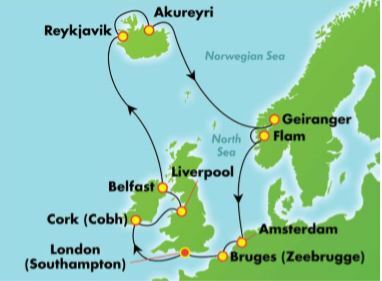 LONDON/SOUTHAMPTON, ENGLAND – Embark the Norwegian Spirit and begin your 15-day cruise adventure. LIVERPOOL, UNITED KINGDOM – A wealthy port city since the 19th century, Liverpool is noted for its rich architectural heritage, diverse communities and innovative infrastructure, as well as being the birthplace of The Beatles. The history of the city as one of the world’s greatest seaports unfolds at The Merseyside Maritime Museum, and the exhibitions at The Beatles Story take you on a journey through the lives and times of the Fab Four. BELFAST, NORTHERN IRELAND – Exploring Belfast is a treat for urban fans. The city is rife with trendy cafés, restaurants, and nightlife yet it also boasts a lovely historical district. While the city is packed with things to do, rural landscapes are within a short reach. BERGEN, NORWAY – View this lovely and charming Norwegian city from your cruise ship and you’ll see how the city is nestled between seven mountains, seven fjords and the North Sea. The Norwegian King resided here, and many historical events took place in this busy port. These events come alive when you amble down the old streets of Bryggen, past picturesque, wooden buildings and the Romanesque-style St. Mary’s church. FLAM, NORWAY – Situated deep within the valleys of Norway, Flam is a nature lovers’ escape. The towering mountain cliffs and sweeping waterfalls are a pure splendour. The Flam Railway is a point of interest and so are the various fjord sightseeing tours. HELLESYLT / GEIRANGER, NORWAY – Looking for natural wonders that are truly wondrous? 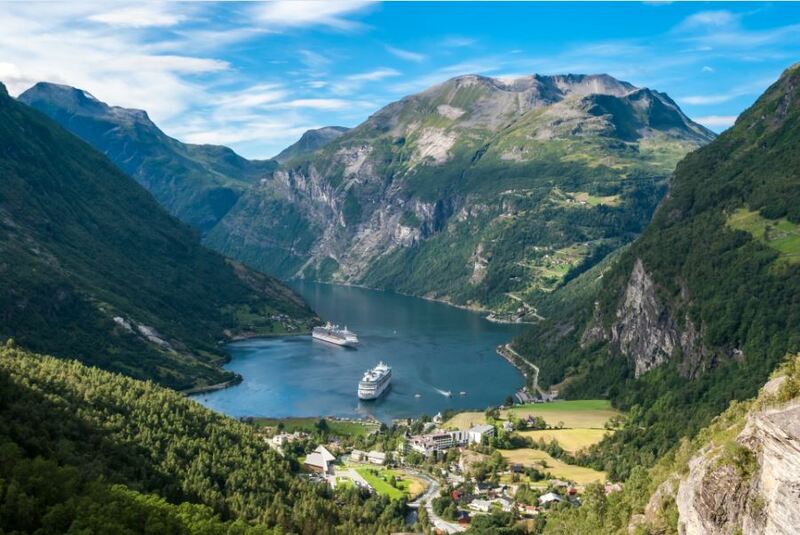 Look no further than the Geiranger Fjord. Emerge from a fairy tale pine forest and gaze at the fjord and surrounding mountains. You’ll find much more to amaze here, from a central waterfall to the winding roads and streams of the Moldskreddalen Valley. A quaint village nestled in a valley in western Norway, Geiranger grants a respite to remember. Visitors come from all over to explore the fjord and its gorgeous views of nearby waterfalls, mountainscapes and charming farms. REYKJAVIK, ICELAND – There’s a good reason that Iceland is considered a photographer’s dream destination. Its terrain is visually stunning, offering views of lava flows, hot springs, unspoiled nature – and colourful, fascinating cities like Reykjavik. The world’s most northerly capital brings together quaint villages, exciting museums, a flourishing music scene and restaurants that rival Europe’s finest. AKUREYRI, ICELAND – Nestled along the shores of one of the most breathtaking fjords in Iceland, Akureyri is the nation’s second largest urban area and a center of Icelandic folk culture. Visit the museums, hike along the extraordinary vistas or explore the botanical gardens. Shop in one of the charming boutiques and then catch a glimpse of the most northerly 18-hole golf course in the world. After you’ve worked up an appetite, feast on some Nordic specialties like smoked lamb and fresh fish and then indulge in an Icelandic fried pastry. AMSTERDAM, NETHERLANDS – Affectionately known as the “Venice of the North,” Amsterdam is actually situated below sea level and built entirely on stakes driven into the ground. The Anne Frank House, The Hague and a Delft Blue Pottery Factory are but a few of the sights that await your arrival. BRUSSELS / BRUGES (ZEEBRUGGE), BELGIUM – The ultimate European city, Brussels has tons of museums, fountains, gardens and great shopping. Stroll the Old Town area to see St. Hubert Arcades and its shops, as well as Butchers’ Street with its plethora of restaurants and cafes and the Grand Place with its Baroque guild houses. PLEASE NOTE: ITINERARIES DO VARY SLIGHTLY ON SOME SAILING DATES. 15-Day cruise aboard Norwegian SPIRIT. Transfers airport/pier/airport with our flights. Deposit of $1,000 per person is due to secure your booking final payment is due 125 days prior to departure. All above fares are subject to change without notice. Shore excursions are not included.